Here at 888casino, we want you to start with a WIN! We’re giving you €88 FREE to play some of the best online slot and table games, NO DEPOSIT NEEDED. This offer is just a taste of the 888casino Hot Promotions coming your way, including BIG Bonuses, FAB Free Spins and FANTASTIC FreePlay. 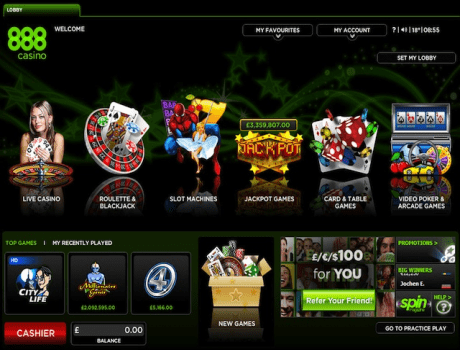 With over 20 years of online gaming excellence, you’ve come to the right place. Enjoy! This Promotion shall be open only to players who are located in the UK, Germany, Austria, Canada, Sweden, Switzerland, Ireland and Netherlands at the time of their participation in the Promotion. The entire FreePlay credited to a player's account must be used within 14 days of being credited to a player’s account, unused FreePlay and any accumulated winnings that have not met the wagering requirements will be removed from the account thereafter. Max total FreePlay win under this promotion is €15, unless a player hits the Jackpot. FreePlay wins will be credited to the player’s account only after the player has finished playing all of the FreePlay granted under this Promotion. All winnings related to FreePlay granted under this Promotion must meet the wagering requirements within 90 days of being credited to a member's account, if such winnings, are not used by a player such winnings will be removed after the 90 (ninety) day period. Wagering on all games at 888casino will contribute towards wagering requirements but certain games will contribute greater than others.